Do you need to find the sum of a subset of cells in Excel spreadsheet that has multiple variables? Here, we’ll take a look at how adding a conditional variable (or variables) can help you get to your desired output – and we’ll also offer a few shortcuts along the way. 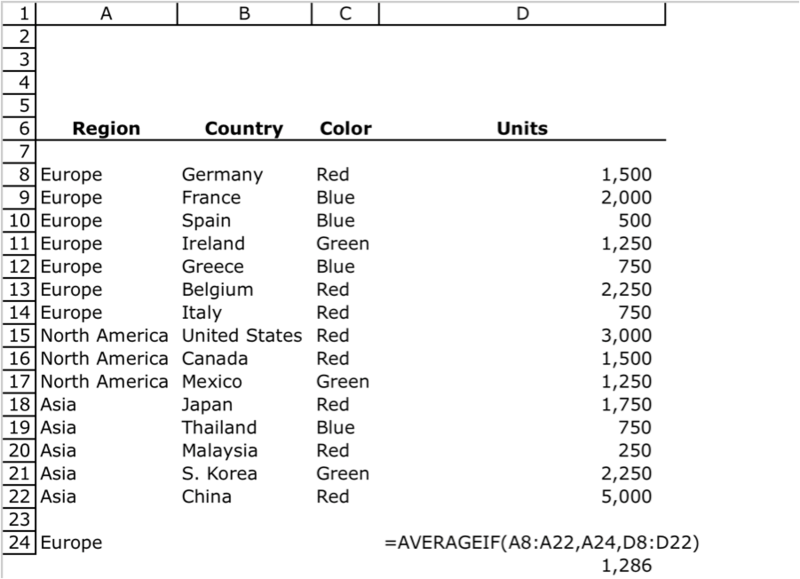 Keep in mind, this approach simply builds on standard SUM formulas in MS Excel, where a range of cells is selected and the output is the sum of the results, and the formula can be copied across broad ranges of columns or rows. “Variable” is in cell A24 (you can also replace the A24 with “Asia”, but that requires editing the formula if you want to find the results for “North America” or “Europe”). Shortcut Tip: If you have multiple columns of data, simply copy the formula to other rows by “locking” your variables and copying the formula across all columns. To demonstate using the formula above, our formula would then become =SUMIF($A$8:$A$22,$A24,D$8:D$22); where the column identifying “Region” (Column $A$) is locked for rows and columns, the Region to sum (Cell $A24) is locked for column, and the units (Column D$) lock the rows, but not the column – so that the formula can be copied to other rows. * Note: this formula is not restricted to the number of variables, meaning you can add Variable3…..VariableX. The key difference here with our IFS formula is that the sum range becomes the first portion of the formula, and the variable range and variable become the 2nd, 3rd, etc portions. AVERAGEIF and AVERAGEIFS can be substituted in the formulas above to get the average of a single or multiple variable. Shortcut tip: Formulas to measure the number of occurrences can also use the IF and IFS function with the following formulas: COUNTIF(Variable_Range,Variable) and COUNTIFS(Variable_1_Range,Variable_1,Variable_2_Range,Variable_2). Remember, 8020 Consulting can also assist you with complex accounting or finance matters that can make a significant and immediate impact on your bottom line. Take the first step now by telling us what you’re looking for.